When travelling through the traditional weaving countries buying rugs and textiles, it is impossible to ignore the incredible old artifacts and the wonderful traditional artisanal skills. Here is a selection of items I could not resist. 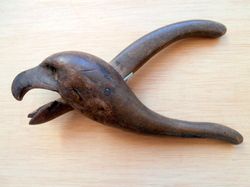 MOROCCAN BERBER WOODEN NUTCRACKER. Rural Berbers use many of the natural resources to make items for their own use. These nutcrackers are hand carved from solid cedar wood and consist of two pieces, the lower one is fitted through a hole in the handle of the upper piece. They are exceptionally strong and are the work of the Berbers of the High Atlas region of Ouaouzguite. A similar type is shown as plate 20f in the textbook "Tazenacht", page 46. Reference 2687. Size 20cms., or 8ins. long. Euros 90. 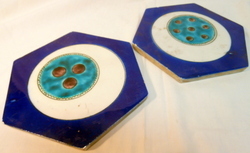 ANTIQUE CERAMIC TILES - a pair from the famous workshop of Azim Cini in the town of Kutahya in western Turkey, early 20th century. Reference 3001. Size, 17 cms., or 7 inches across. Euros 20 each. 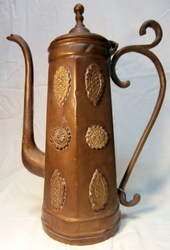 ANTIQUE MOROCCAN COFFEE POT hand made with a mixture of copper and brass and having a design of twelve flowers on the sides. 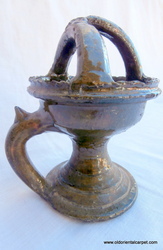 The pot was part of the kitchen ware in the Castillo de Bil Bil whch was built as an Arab Cultural Center on the sea front of the Andalucian town of Benalmadena from 1920 to 1927. It is an elegant piece. Reference 2988. Height 37 cms., or 15 inches. Euros 80. ANTIQUE COPPER TRAY/PLATTER which is a very large size and would have served as a central food dish for a large family meal. It dates from the last half of the 19th century and the exceptional hand beaten design suggests a Persian origin. There are several depictions of the leaf design known as the "Boteh" which originated in India in the 17th century and is widely used in Persian and Kashmiri artifacts and textiles. Reference 2999. Diameter 78 cms., or 31 inches. Euros 220. MOROCCAN CERAMIC BOWL This antique container was used to store finely ground powders which Berber women use as fragrances. Its impeccable condition suggests it was used sparingly. Ceramic bowls are an important part of Berber life and many have one particular function which is often indicated by the shape. The text book "Splendeurs du Maroc" published by Musee Royal de l'Afrique Centrale in 1998 has very detailed information on this type of work. Reference 2591. Size 15cms. 6ins. high. Euros 85. MOROCCAN COPPER ARTIFACT. 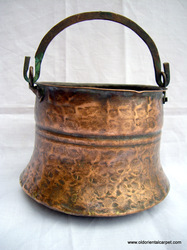 A late 19th century hand made small copper pot complete with handle and was probably the work of Jewish craftsmen in Marrakech. See `Splendeurs du Maroc` - Musee Royal de l`Afrique Centrale 1998 page 42. Reference 2043. Size approx.14cms, 6ins, high. Euros 85.